Clear all jellies and reach 42000 points to complete the level. This level has medium difficulty. 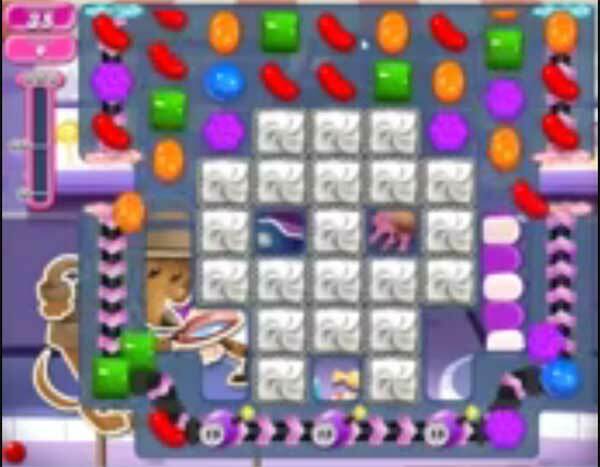 For this level try to play near to blockers to break them and as you have more candies to play or play from bottom to shuffle the candies and make special candy. Combine special candies with each other to break more jellies and blockers to reach the target. Been on this for ages!!!!! I’m fed up too, with all these really hard levels. Thee words! THIS GAME su***! ??? Don’t buy anything, don’t use your boosters. They don’t Gall where you want. They Gall on places you cant do anything with iT. Waisting time. So don’t buy or use your boosters. Better stop playing for quit a while, or stop! Play the game, read the comments and stop playing this game. Good advice. I don’t know why they game can’t give you a break between excessively hard levels instead of hard level after hard level. It makes a player want to quit this stupid game. this is the toughest one yet. Have patience my soda crush friends, a good board will eventually show up. I have no boosters, and I’m not buying any. I will see you guys complaining at later levels. Just have fun and concentrate. Spend more time on beating the level, and less time complaining!